Home / Unlabelled / Shop the New Little Golden Books baby collection at Gymboree! 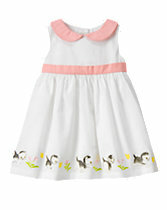 Shop the New Little Golden Books baby collection at Gymboree! 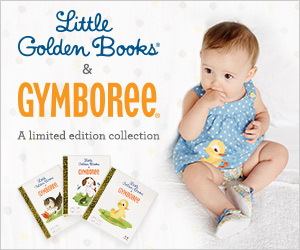 Gymboree has launched their new their New Little Golden Books baby collection. In this collection, Gymboree celebrates One Big Happy Storytime with the launch of a limited-edition iconic characters from Little Golden Books. The Poky Little Puppy, The Fuzzy Duckling, and The Shy Little Kitten all come to life in cute, cozy, giftable clothing and accessory sets. I can remember having many titles of the Little Golden Books in our family home. Starting from a very young age and right up into my preteens enjoyed reading these classics. I have fond memories of my mom, younger sister, and I sitting together reading. Some of my favorites are The Poky Little Puppy, Three Little Kittens, and The Brave Little Tailor. I am so thrilled to hear that as I pass down these favorites to my own children, that Gymboree has introduced clothing and accessories with the Little Golden Books theme. The pieces from the New Little Golden Books baby collection are all so cute and cozy looking. 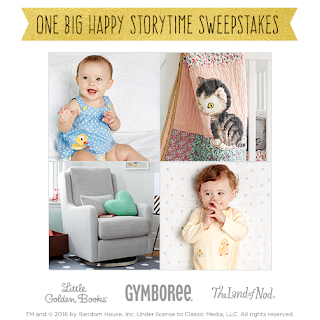 As part of the Little Golden Books baby collection launch, Gymboree is hosting a One Big Happy Storytime sweepstakes, giving away everything a family needs to make storytime extra special. Enter for the chance to win over $2000 in prizes including, Little Golden Books nursery bedding, and decor from the Land of Nod, a set of Little Golden Books from Random House, and a $500 gift card from Gymboree. View rules and enter at gymboree.com/littlegoldenbooks now through February 29; winners will be announced in march. Do your children have any Little Golden Books? What are some of their favorites? These are pretty. Gymboree always has the best collections. Oh how neat I used to love those !!! I have a nephew, I love those baby garments, I'm gonna check this out. I should have seen this sooner because I just attended this children's party and I absolutely had no idea on what to give. The items you've shared are all so cute. Any parent would love to receive them for their little ones. I love this Little Golden Books baby collection, especially Little Kitten dress, it’s so adorable :-) If I had a child, I would buy it :-) Thanks for your post! I don't think we have this brand in the UK, but they are really cute. Awwwww how cute!!! I was obsessed with Gymboree when my princess was itty bitty!! !